In 1988, two years after Martin Luther King Day was first observed as a national holiday, I was working late into the evening with then Pennsylvania Secretary of Labor and Industry, Harris Wofford. Harris had been a close friend and colleague of Dr. King during the civil rights movement. He and I began discussing the irony of the holiday. Despite Dr. King’s legacy as a champion of action and social justice, in the two years since the national holiday began, the celebration of his life was turning into just another day off for millions of Americans. Harris thought that Dr. King would have been “appalled” had he known that young people were using his holiday to sleep late, go to the mall, and watch television, rather than engaging in efforts that better reflected his legacy. Harris and I envisioned a different kind of holiday, one more fitting of a person dedicated to social change. We imagined diverse groups of people throughout the nation celebrating Dr. King’s legacy by serving others. This service would bring together people of all ages and backgrounds to identify pressing community challenges, turn concerns into citizen action, and build partnerships that would act as a springboard to sustainable civic engagement. By 1994, Harris was a U.S. Senator from Pennsylvania, and I was his state office Chief of Staff. While six years had passed since our 1988 late night conversation, we would often ruminate that the Martin Luther King holiday needed to include honoring Dr. King in other ways fitting of his legacy. Then, Harris, along with legendry Atlanta Congressman John Lewis, championed this call to citizen action by co-authoring the King Holiday and Service Act. President Clinton signed this legislation into law later that year, creating the national Martin Luther King Day of Service. In 1996, I organized the first King Day of Service in the nation in Philadelphia. That first year, just days after the city had been paralyzed by the largest snowfall in its history, over one thousand volunteers showed up for the King Day of Service. Philadelphia public school students and AmeriCorps national service members made up the majority of contributors that day. Now, twenty-three years and 1.6 million volunteers later, the Greater Philadelphia King Day of Service is the largest King Day event in the nation and part of a nationwide day of civic action. This year is the fiftieth anniversary of Dr. King’s assassination. 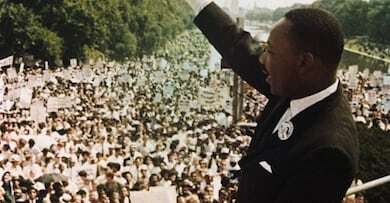 In honor of his living legacy, some 150,000 volunteers are serving tomorrow in more than 1,800 King Day of Service projects throughout Pennsylvania, New Jersey, and Delaware. Our overarching theme is the fiftieth anniversary of Dr. King’s Poor Peoples campaign. Focusing on food justice and access, Pennsylvania Governor Tom Wolf, US Sen. Bob Casey, and Philadelphia Mayor Jim Kenney will lead volunteers sorting and packing food. This food will be distributed to people in-need through hundreds of Philadelphia-area non-profit organizations. Volunteers will also construct grow light stands for cultivating seedlings, building vegetable pallet gardens, and creating compost bins, which will be used mostly by Philadelphia public school students. What started in Philadelphia as a project has become a national movement, with projects taking root in hundreds of cities, large and small, across the nation. Dr. King said, “If a man doesn't have a job or an income, he has neither life nor liberty nor the possibility for the pursuit of happiness. He merely exists.” With his commitment to economic justice in mind, we are also hosting our 7th annual Jobs and Opportunity Fair, with five hundred prospective employees choosing among thirty local employers that offer real jobs. We are committed to empowering individuals with opportunities to make valuable contributions to society. Since Dr. King was committed to social change 365 days of the year, our King Day of Service has evolved into a year-round program to promote and support sustainable civic engagement. We provide ongoing volunteer opportunities, support community partnership-building, make available a service learning curriculum for students, and organize quarterly discussions on race relations. All of this work is done with the mission of building a sense of community and demonstrating how much more we have in common than divides us. If Dr. King were alive today, he would no doubt be working for greater economic opportunity and social change. In Philadelphia, and across the nation, millions of Americans from all backgrounds and ages are celebrating his legacy by serving in thousands of different ways that honor him, embracing his legacy, and bringing his memory to life. I would also argue these are acts of patriotism, particularly at a time as tense as this one. Never in my memory have we been as divided as a nation. On this day, the legacy of Dr. King could bring us together with a collective purpose of healing some of these divisions. We can build common ground through making a difference in communities across the nation.